Supports Pale Moon [25.0a1pre - 28. 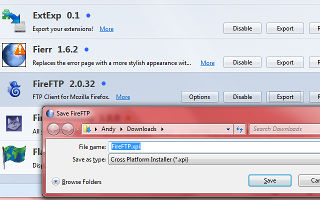 *], Firefox [2.0 - 50. *], SeaMonkey [2.0a1 - 2.40], Thunderbird [2.0 - 50. *], and Sunbird [1.0b1 - 5.0b2pre]. NOTICE: The Browser you're using may not be supported by ExtExp. If you believe this to be in error, please check your browser's User Agent settings. ExtExp is free software supported by donations, not advertisements. Welcome to the ExtExp home page! This simple extension is designed to do only one thing: place an Export Button on each extension and theme in your Add-ons Manager. ExtExp was just created in November of 2017, after Mozilla Firefox and Thunderbird had already converted to WebExtension standards. ExtExp may be considered a Pale Moon and SeaMonkey extension that still supports older versions of Firefox and Thunderbird. ExtExp is free for use or modification without limitation. However, it comes with no license, warranty, or guarantee of any kind. That being said, you can still ask any questions in the Comments section below, or contact me directly for assistance. I tried mucking around in install.rdf & the chrome folder, trying to make them work in Basilisk, but failed miserably. I'll leave it to the pros, if you're so inclined. I suspect a lot of people will use both Pale Moon & Basilisk together... at least those who refuse to follow the chrome lemmings over the cliff.